Weight of saddle, without girth, is about 16 pounds. Standard hardware (rings, loops and other hardware) are stainless steel, which is very durable and will never rust. Solid brass optional feature at added cost. Thick double-foam cushion in seat will not go flat after years of wear. Tail crupper ring is standard. 4" high cantle for maximum back support. Oil-tanned seat leather is soft and extra-long wearing. Strings, as well as rings, on front and rear to secure all trail items. Skirts are lined with heavyweight, breathable material designed for durability and to prevent saddle slippage. Skirts are laminated with ultra foam for shock absorption. One and three-fourths inch heavy nylon stirrup strap and leather reinforced holes. Stainless steel or solid brass single prong roller buckle on stirrup leather allows easy adjustment and no bulk against the skin. 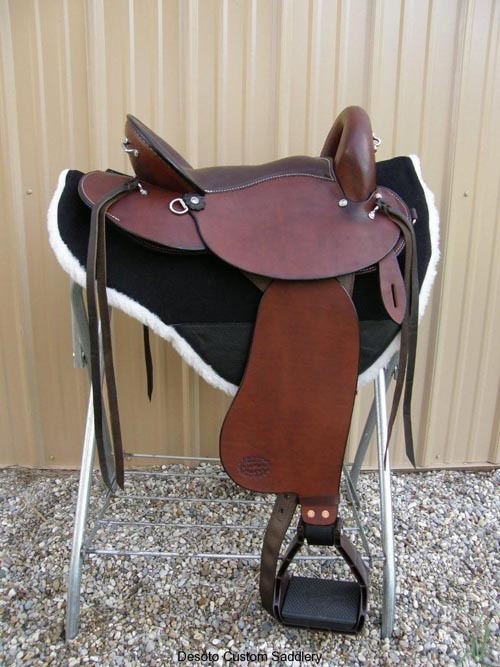 Stirrup leathers are completely free-swinging and give the freeness of riding an English saddle. Fork is thin enough to wrap your hand around, high enough to allow room for all horses' withers, but low enough so that it won't interfere with your movements while climbing uphill or leaning forward to avoid low branches. The edge of the side jockey under your leg is tapered down to prevent rubbing. All saddles heavily oiled before leaving the shop and need very little break-in time. Image shows some optional features.